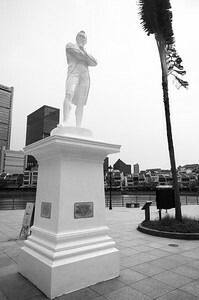 The Raffles' Landing Site is denoted by a statue of Sir Stamford Raffles, and is located on the north bank of the Singapore River. 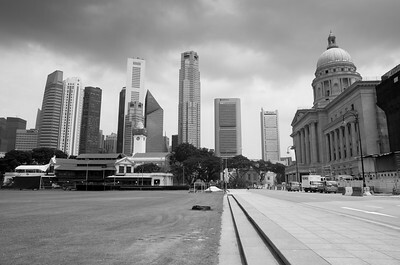 The figure marks what is thought to be the site where Sir Stamford Raffles landed on 29 January 1819. The SCC was established in 1852. 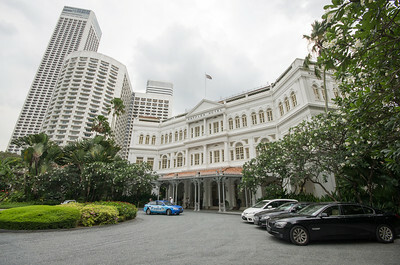 Over the years, the club has had three clubhouse buildings on the Padang. The first was erected in the 1860s and the second in 1877. The third, which forms the core of the present-day clubhouse, was built in 1884. The SCC today has over 3,000 members. 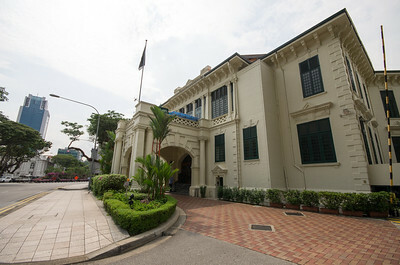 Cricket, rugby, soccer and field hockey are played on the Padang, and the club also has facilities for squash, tennis, lawn bowls, billiards and snooker. The club has played host to many international cricket events over the years. 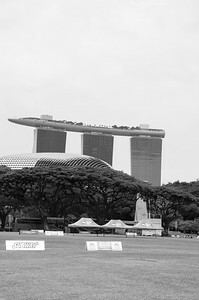 It also hosts the annual Singapore Cricket Club International Rugby Sevens tournament and an annual Soccer Sevens competition. 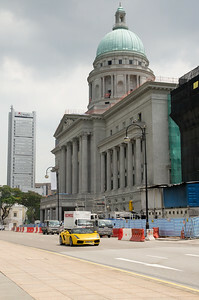 The new Parliament House was designed by the Public Works Department, and comprises three new blocks (Chamber Block, Front Block and Public Block) integrated with an existing restored building built in 1864 and which once housed the Attorney-General's Chambers. This block was gazetted as a national monument on 14 February 1992. 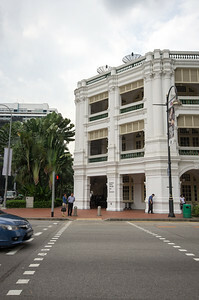 The building was built not only as a venue for parliamentary debates, but also a research centre and meeting place for the members of parliament (MPs), as well as a place of interest for students and the general public. 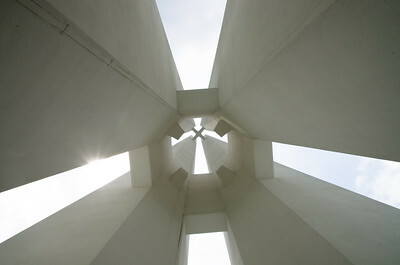 The monument was named the Civilian War Memorial but was affectionately known as the "Chopsticks" memorial with reference to its design. 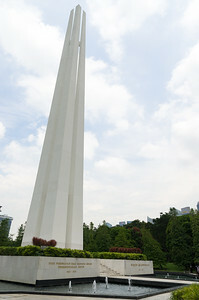 With four pillars each with a height of about 67 metres, the monument resembles two pairs of chopsticks. 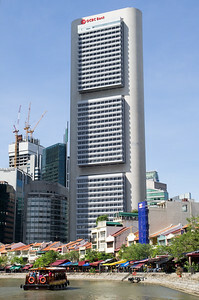 The design of the four pillars bears a significant meaning - they symbolise the four main races of people living in Singapore. Words were inscribed on the base of the memorial. In four languages, English, Mandarin, Malay and Tamil, the words read: "Memorial to the Civilian Victims of the Japanese Occupation 1942-1945". 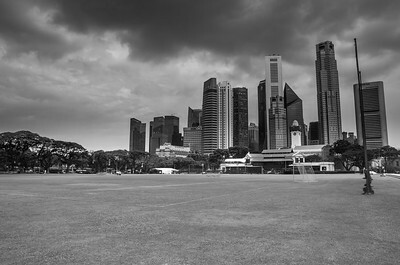 The Padang is an open field located within the Downtown Core of the Central Area in Singapore, at the heart of Singapore's central business district. 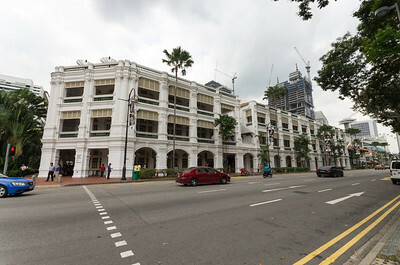 It was formerly known as the Padang Cricket Ground. The Padang was a popular place for residents to meet, relax, take walks and find recreation. It had been a place for social gatherings before colonialism, with Malay and Indonesian seafarers racing their boats off the coast near the Padang. In 1834, the Europeans started holding their annual New Year Regatta there and it soon expanded into a full-scale Sports Day. New Year's eve would bring fireworks to the Padang while New Year celebrations saw the sporting activities of the Singapore Cricket Club and Singapore Recreation Club held here. 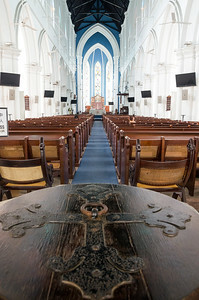 Saint Andrew's Cathedral is an Anglican cathedral in Singapore, the country's largest cathedral. The logo of the Cathedral is the St Andrew's Cross. Designed by George Dumgoole Coleman, the original Saint Andrew's Church was built from 1835 to 1836. The second Church of Saint Andrew was designed by John Turnbull Thomson and built in circa 1842. Rumours of unhappy spirits and damage caused by two lightning strikes in 1845 and 1849 resulted in its closure in 1852 and subsequent demolition in 1855. Colonel Ronald macPherson, the Executive Engineer and Superintendent of convicts, designed the new church. To cut costs, Indian convict labour was used, as it was for many buildings of the day. Daniel Wilson, bishop of Calcutta, laid the foundation stone on 4 March 1856, and the first service was held on 1 October 1861. George Cotton, who succeeded Daniel Wilson, had the honour of consecrating the cathedral on 25 January 1862. 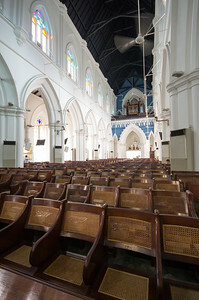 In 1869, it was transferred from the jurisdiction of Calcutta to the Diocese of Labuan and Sarawak and, in 1870, Archdeacon John Alleyne Beckles consecrated it as the Cathedral Church of the United Diocese. 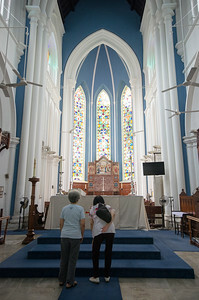 In 1942, shortly before the fall of Singapore to the Japanese, the cathedral served as an emergency hospital. 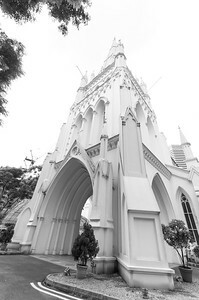 Saint Andrew's Cathedral was gazetted as a national monument on 6 July 1973. 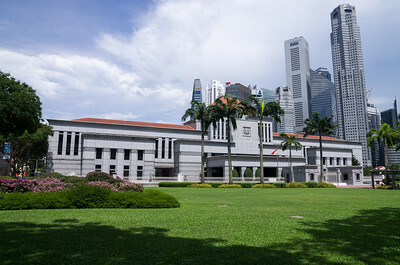 The City Hall in Singapore is a national monument gazetted on 14 February 1992. 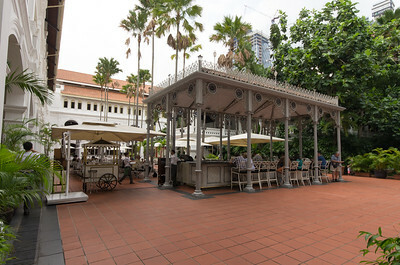 It can be found in front of historical Padang and adjacent to the Supreme Court of Singapore, it was designed and built by A. Gordans and F. D. Meadows from 1926 to 1929. Boat Quay is a historical quay in Singapore which is situated upstream from the mouth of the Singapore River on its southern bank. 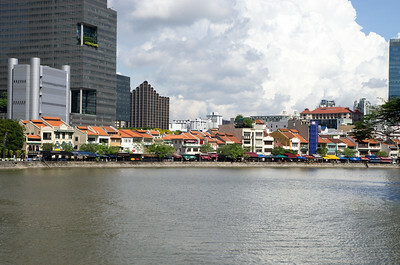 It was the busiest part of the old Port of Singapore, handling three quarters of all shipping business during the 1860s. Because the south of the river here resembles the belly of a carp, which according to Chinese belief is where wealth and prosperity lay, many shophouses were built, crowded into the area. 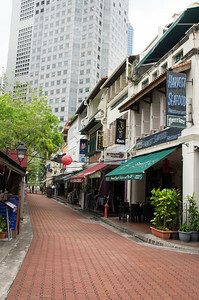 Though serving aquatic trade is no longer Boat Quay's primary role, the shophouses on it have been carefully conserved and now house various bars, pubs and restaurants. 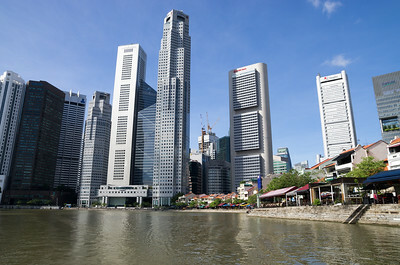 Therefore Boat Quay's social-economic role in the city has shifted away from that of trade and maritime commerce, and now leans towards more of a role accommodated for tourism and aesthetics for the commercial zone of which encloses the Singapore River.